South on Main, 1304 South Main St.
Cocktails and Buffet Dinner supporting scholarships for UA Little Rock dance students to participate in Summer Intensivew at Accademia dell'Arte in Tuscany, Italy. This unique event will allow you and your friends to play a shamble golf tournament paired with one of the talented golfers from the 2017-18 Little Rock men’s and women’s golf teams or a Little Rock Golf alumnus. 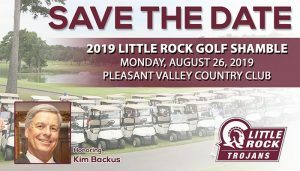 The event will benefit the Friends of Bruce Munson, Little Rock Golf Tournament (fundraiser for Golf Foundation), and every dollar raised will go directly to the golf teams for scholarships, travel, equipment and tournament expenses. Purchase tickets. 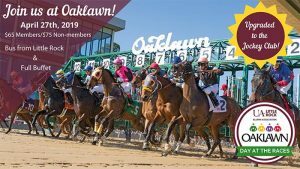 Please join us for silent and live auctions, cocktails and heavy hors d'oeurvres during the eleventh-annual SpectacUALR fundraiser. This year's event will honor Lee and Greg Hatcher. Attire is business casual. For more information, contact Tyson Baldwin at twbaldwin@ualr.edu or 501-350-4653.